During the last twenty years, scientists worked hard to protect and restore the scattered patches of a dilapidated forest and its surroundings of agricultural and fallow vegetation in southern Benin. With the help of their locally recruited assistants, Peter Neuenschwander, International Institute of Tropical Agriculture, Benin, and Aristide Adomou, University of Abomey-Calavi, Benin, successfully thinned out the alien timber growing there and introduced 253 species, whose seeds and plantlets they had managed to collect from the last remnants of the original forest. Their research article is published in the open access journal Nature Conservation. 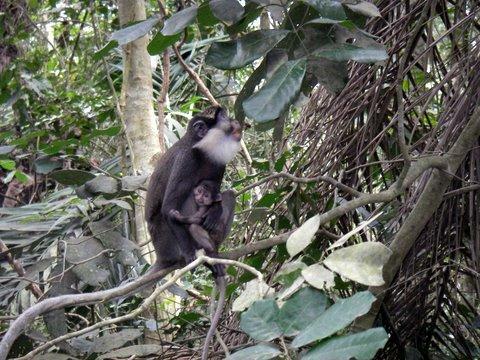 Today, the rehabilitated forest in Drabo harbours about 600 species of plants and constitutes a sanctuary for many animals, including the critically endangered and endemic red-bellied monkey. Over the course of the last two decades, pantropical weedy species declined, while West-African forest species increased in numbers. Of the former, fifty-two species, mostly trees, shrubs and lianas, are listed as threatened – more than those in any other existing forest in Benin. Furthermore, some of the critically endangered species amongst them can be found exclusively in the last small, often sacred forests in Benin, which while covering merely 0.02% of the national territory, harbour 64% of all critically endangered plant species. "The biodiversity richness of the rehabilitated forests of Drabo now rivals that of natural rainforest remnants of the region," note the authors. The newly restored forest in Drabo is relatively easy to access due to its proximity to large towns. It is intended to become an educational and research centre maintained by the International Institute of Tropical Agriculture. In fact, it already serves as an exemplary forest in the region. With their initiative, the scientists and their followers demonstrate that by involving local communities and taking their customs into consideration, the safety of exposed precious ecosystems, even if located in a densely populated area, can be effectively assured.